Posts. So, those candidates who are willing to work with this organization they May apply for this post. Last Date of Apply 06-May-2017. Total numbers of vacancies are 45 Posts. Only those candidates are eligible who have passed Bachelor’s degree from any University recognized by Govt. of India and An Officer with 5 years Commissioned Service in Indian Army/Navy/Air Force OR A Gazetted Police/Para Military/Central Police Organization’s officer not below the rank of Assistant Comdt. 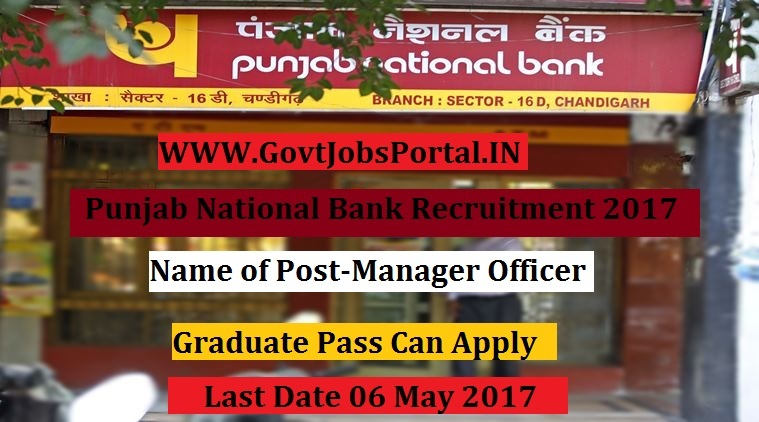 Indian citizen having age in between 20 to 40 years can apply for this Punjab National Bank Recruitment 2017. Educational Criteria: Only those candidates are eligible who have passed Bachelor’s degree from any University recognized by Govt. of India and An Officer with 5 years Commissioned Service in Indian Army/Navy/Air Force OR A Gazetted Police/Para Military/Central Police Organization’s officer not below the rank of Assistant Comdt. What is the Process for Selection this PNB job? 1: Selection will be held on Written Examination.